Answer our online poll for Florida’s next governor. Poll expires on August 9, 2014. Answer our online poll for Florida's next governor. Poll expires on August 9, 2014. In a new Quinnipiac University poll out this morning, July 23, 2014, the Libertarian Party of Florida candidate, Adrian Wyllie gains steam as Florida voters seek out alternatives to Rick Scott and Charlie Crist. The last Quinnipiac University poll conducted on the Florida Gubernatorial race on April 30, 2014 did not include Wyllie’s name, so now Quinnipiac has a base-line to go by for future polls. Wyllie starts that base-line at 9% throughout Florida and that is with 92% of those polled not knowing enough about him to form an opinion. 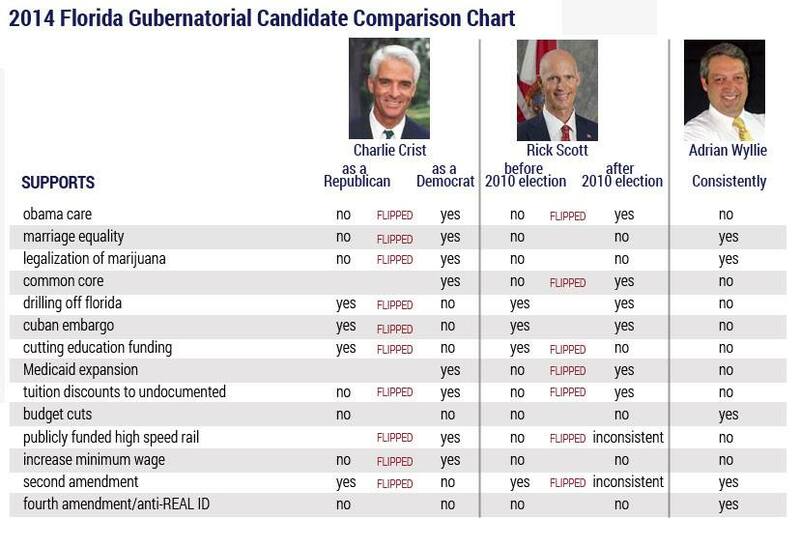 This is clearly a failure by the general media to inform the public about the candidates running to be Florida’s next governor.